Before anti-Spain hysteria reaches fever pitch, before the tabloids play the Joe McCarthy role in encouraging the demise of tiki-taka (‘the end of an era’ and so on) and before ‘fast-break soccer’ becomes the vogue; I would like to make a case that tiki-taka is, in fact, not dead. Tiki-taka is a phrase often used in contemporary football after it was coined by the late broadcaster Andrés Montes, but what does it really mean? Essentially, tiki-taka is a style of play consisting of short, quick, precise passing and darting movement, retaining possession and finding pockets on the pitch in which players can pull the strings. It is a brand of football epitomised by Barcelona and the Spanish national team in the last few years. Alas, the lauded – if a little tedious – style has experienced some turbulence in recent times with Spain and Barcelona, the curators of the famed and celebrated tiki-taka style, both enduring a horrendous twelve months. We have watched, with a mixture of excitement and pity, the Spanish national team wilt in the face of a technically gifted, defensively resolute and mentally resilient Netherlands side and an exuberant, energetic and industrious Chile outfit. The Spaniards were underwhelming this summer in a campaign that is best portrayed by Vicente Del Bosque’s solemn walk along the touchline in the final moments of the Dutch drubbing, in which he stroked each of his players’ cheek with a weary affection. The Spanish team are still breaking records, but this time, it’s for all the wrong reasons – they are the first defending champions to depart from the greatest show on Earth after just two matches. Meanwhile, Martino’s Barcelona has limped through the domestic season in Spain, losing five games, including feeble defeats to Valladolid and Granada, and a costly spell spanning just over a month in which Barca picked up only nine points from a possible eighteen. Alongside these glaring underperformances, more physical, direct and miserly teams have flourished in Spain, namely Atletico Madrid. Los Colchoneros have excelled in La Liga, topping the table with a romantic, title-winning draw against the unconvincing Catalonians. The significance of Atleti’s prosperity is that Simeone’s style of football is distinct from tiki-taka; almost a counter to tiki-taka, Simeone transfers his zeal and passion to his players, whose defence exudes composure and robustness, whose midfield hustles and hassles tirelessly and whose striker (Brazilian defect Diego Costa) simply scores (scored) goals. While Barca opt for a slower, more precise passing game; Atleti employ a quicker, more direct (not in a Sunday League relegation-candidate way) and more physically-orientated style. Tiki-taka is, it is perceived, becoming less effective, and the duo of a rigid defence and a potent counter attack is prevailing. Thus, with Barca’s dwindling success and Spain’s group stage slump this summer, it would be easy to consider the concept of tiki-taka deceased. So, therefore, we must address the question: why isn’t tiki-taka dead? Well, cast your mind back to 25th March 2014, the date on which Pep Guardiola’s Bayern Munich side comprehensively demolished their meek Bundesliga rivals. Guardiola, for four trophy-laden years, implemented a tiki-taka style at the Nou Camp, steering Barca to inconceivable success, winning 14 trophies in just four years. He did the same in Bavaria – his FC Hollywood quashed their opponents in the perfect implementation of tiki-taka, seizing the title in just 27 games and a staggering 94 goals. And they say it’s dead. Similarly, it is easy to forget that Barcelona had a marvellous ‘worst season in years’ last term, finishing second in the league, scoring one hundred goals, conceding only 33 and racking up 87 points. They were enduring a season of transition in the post-Guardiola era, adapting to a different managerial style and coping with an ageing squad. Moreover, Spain did not play tiki-taka in Brazil this summer; therefore their failure cannot be associated with the fall of tiki-taka. Spain, instead, exhibited a sluggish, laboured, coma-inducing brand of football. They played without conviction and incision, qualities that characterised their reign over world football in the last six years. 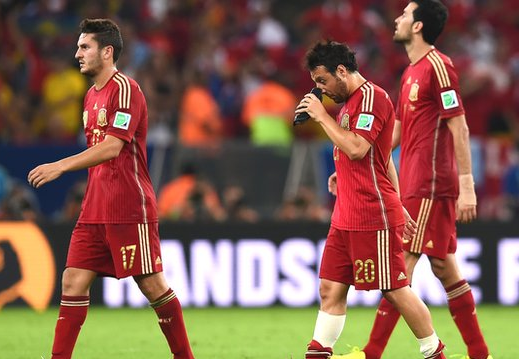 Tiki-taka means, beyond the glamour of the Spanish jargon, pass and move – Spain struggled to pass or move. In the final third, Spain were awkward and disjointed (perhaps attributable to Diego Costa’s less refined and technically adept presence). Against the Netherlands they completed 86 passes in the final third and had a mere five shots from within the penalty box. In short, Spain was simply not playing true tiki-taka football. It seems tiki-taka is not dead, just sleeping. Hence, it is not ‘adios’ but ‘hasta la vista’ tiki-taka. I agree, Spain is not dead, tiki-taka is not dead!!!! !, wait until Euro 2016. Hope Guardiola have finished his contract with Bayern to take over Spain. Well done Spain for showing your true colours (black + tiki-taka) against Australia. I am so happy for Villa, Torres and Mata. They deserve. At the same time I have to remind you all that Spain is still the current world and European Champions and No.1 in FIFA ranking.